“I have slept in my own bed 20 times in the last year.” This was Swamiji’s patient and conclusive statement that finally melted the strong resistance pocketing the room. She was answering questions about her decision to stop travelling so much and build an Ashram and home for herself and all of us. 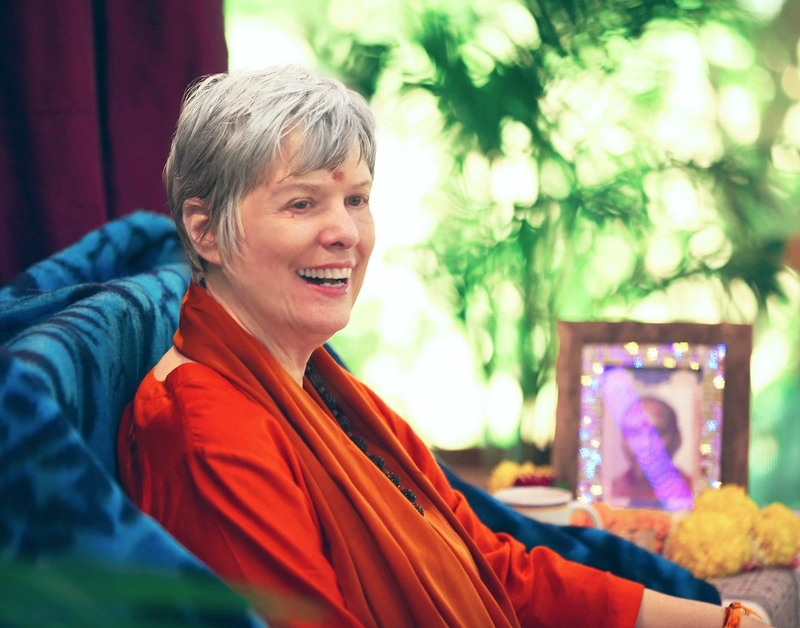 Being excited about the Ashram, I was drifting in and out, not particularly invested in the details, when her statement jumped out at me. I had known for years that Swamiji travelled extensively. I just never gave it much thought. Now my mind boiled with the question, “How did she do it? How did she do it?…” How did she realize the Self so fully, bouncing from airport to airport, hotel room to hotel room? The contemplation of this question has transformed my practice, particularly when I travel. Where I used to dread the upset to my schedule and overwhelming distractions, I now look forward to the challenge of employing some of the deeper practices more earnestly. I have learned that I can repeat mantra throughout an entire conversation and be simultaneously immersed in both. I have found that humming chants to myself during a big family dinner keeps me truly joyful in what might otherwise be an exercise in anger management. I have fallen in love with meditating in the passenger seat of a car, on an airplane or in a noisy terminal, where the typical annoyances become catalysts for inner expansion. While the circumstances of travel may not be ideal for deep experiences of the Self, these practices help maintain a consistency to my state, which, in many ways, I have found more profoundly transformative than the exalted inner absorption I get glimpses of in my regular practice. And there are still many moments, even whole days of travel, when my practice is fleeting at best and is constantly being interrupted. Samadhi seems impossible on days like this. It is then that Patanjali’s Sutra 1.21- “Samadhi (absorption in the Self) is nearest to those whose desire for it is intensely strong”* reminds me of yoga’s fail-safe practice — the cultivation of mumukshutva (the desire for the Self). When I come to the end of a day of travel (or any given day) and I reflect back on my practice of the day to find it lacking, mumukshutva arises immediately in me. It initially feels like regret or self-condemnation, or even blame. And it hurts, deeply. Yet, as I continue to look at it in the light of a Great Master who spent 345 nights of the year away from home, the edges of that ache soften. A few Ujjayi breaths and I am filled with a blissful yearning for the same Grace that carried Swamiji across many miles to Her Fully-Realized State. And that desire burns inside, with tremendous warmth and radiance, because I know that Swamiji offers me that very same Grace and the promise that comes with it. As I whisper the mantra to myself, I melt into gratitude for this great longing that draws me ever closer to my Self, and drift off to sleep, doubly inspired for my practice the next day. When all else fails, it is your mumukshutva that keeps you close to the Self. So when you travel, take your mumukshutva with you. For the immensity of the promise it holds, it weighs nothing and takes up no room in your luggage. This entry was posted in Ashram News and tagged ashram, Grace, Mumukshutva, Practices, travel on August 26, 2014 by Svaroopa Vidya Ashram.